Everybody wants to see your beautiful soapstone! Everybody wants to see your finished soapstone project and posting it on the Dorado Soapstone Facebook page could win you a free jar of Dorado Soapstone Dry Wax valued at $39.95. Have you had Dorado Soapstone installed in your home? Is it beautiful? Do you love it? Would you share it here on Dorado SoapstoneFacebook? Win a free 8 oz. jar of Dorado Dry Wax valued at $39.95. Post your photo(s) and add a comment if you care to. Then, the photo that receives the most Facebook “likes” by August 31, 2015 will get its homeowner a free 8 oz. 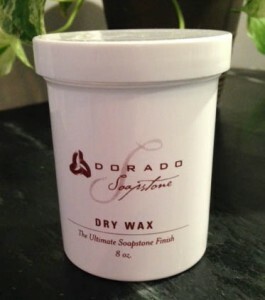 jar of Dorado Soapstone Dry Wax valued at $39.95. Post your photo(s) here today! Then call your friends and ask them to visit and “like” your photos. Then call them again to come over for a waxing party when you Win Dorado Dry Wax☺. Enter to win wax today!